Water soluble PVA film is a new type environmental protection material exploited successfully and has been intensively used in recent years. It is verified by microorganism tests that PVA is non-toxic and doesn't restrain from the growth of microorganism and can be degraded totally.It has no any bad effect on environment. Once PVA is dissolved in water, specific microorganism will cause it to degrade. When treated with activated sludge, solutions of PVA will be decomposed into water and carbon dioxide. Laundry bags in hospitals etc. SF ECO-FRIENDLY PRODUCTS LIMITED has over 10 years of experience in the manufacturing of all kinds of plastic bags, and in line with our expansion on our export business.We improve our technology for packaging products in water-soluble film in recent years. We welcome and willingly assist our customers in their innovative ideas on all kinds of shapes in their plastic packaging they need. SF ECO-FRIENDLY PRODUCTS LIMITED has excellent reputation for products quality and delivery. 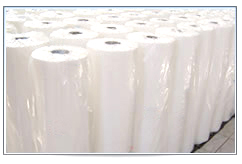 Water Soluble Laundry Bags for clinical use and hospitals.